By Scott Gilfoid: Former two division world champion Tim Bradley expects Errol “The Truth” Spence Jr. (21-0, 18 KOs) is going to be really tested by a fighter he rates highly in IBF welterweight champion Kell “Special K” Brook (36-1, 25 KOs) in their fight in a little over 1 months on May 27 at Bramall Lane in Sheffield, England. Bradley, 33, says that if Spence can pass that test, it will say a lot about his talent level. According to Bradley, it doesn’t matter how Spence beats Brook just as long as he gets past him with the victory. “I love Errol Spence too,” said Tim Bradley to Fighthype.com. “Errol Spence is a great fighter. He will get his test here soon against a really great fighter, a really good welterweight Kell Brook. So he will get tested. Now if he passes that test and destroys and annihilates Kell Brook, then that speaks volumes, because Kell Brook to me is a really good welterweight. He’s just got to win the fight and that’s it,” said Bradley. I think this is going to be more of a test for Brook than it will be for Spence. Brook is the one coming off of an eye injury. We don’t know if there’s going to be residual effects from his busted right eye socket. Gennady Golovkin fractured Brook’s eye socket with a left hook in the 1st round. Brook says the surgeon inserted a titanium plate inside his eye socket to strengthen it after he had surgery on the problem after the fight. But with this being the first time that Brook has fought since the injury, you just can’t know if the eye will be able to hold together once it starts getting hit. Spence hits very hard. If that eye isn’t the same, it might close up on Brook almost immediately. When that happens, I expect Brook to be running around the ring, dabbing at the eye with his gloves, and fighting purely defensively. He’s not going to beat Spence fighting like that. Using boxing to try and beat Spence is a failure waiting to happen. Spence might do a better job of knocking Brook out than Gennady Golovkin did. That would be a big feather in his cap. Brook seems to think he’s going give Spence his first career defeat on May 27. Brook isn’t giving any clues with what game plan he’ll be using for the fight, but there’s only so many things he can do. Spence has seen all of those things in his fights, so I don’t think there will be any element of surprise if Brook chooses to use one of those plans. Brook was able to hold all night long over and over again in his fight against Shawn Porter in 2014. Porter did not look comfortable with the holding. Porter didn’t try and defeat the holding the way that experienced fighters do. Porter was waiting for the referee to do something about it by breaking up the clinches and warn and penalize Brook. That never happened unfortunately. Spence has been training with his trainer Derrick James in how to handle Brook’s holding if he chooses to go to that old tried and true strategy. This is Spence’s coming out party against Brook. It’s a fight that will announce the 26-year-old Spence to the world of boxing. There are a lot of casual fans that will be seeing him for the first time, and it’ll be interesting for them. 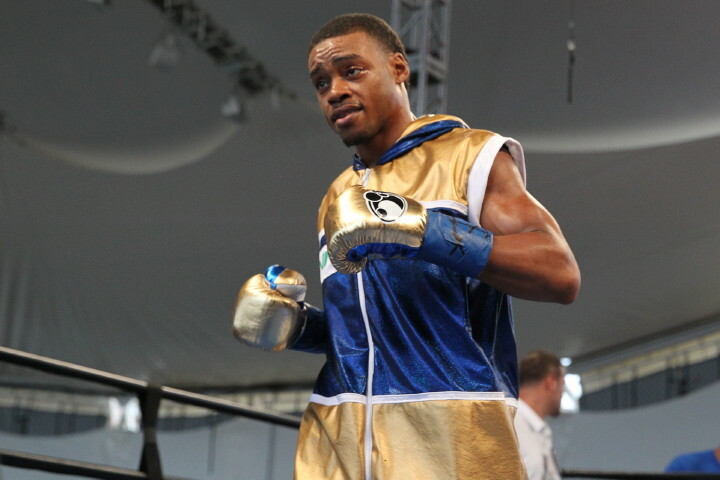 Snatching Brook’s scalp will be a nice trophy for Spence, because the British fighter has only been beaten once in his 14-year pro career against middleweight champion Gennady Golovkin. What would be a real accomplishment for Spence is if he can knockout Brook before Golovkin did by getting him out of there in 4 rounds or less on May 27. Golovkin needed 5 rounds to do the job on Brook. He didn’t get the credit he should have gotten for stopping him due to Brook suffering an eye injury that caused him to bow out in the 5th round. A knockout win for Spence against a healthy Brook would let the boxing world know that we’ve got a major talent on our hands. Of course, there would be no stopping Brook from blaming another loss on an injury. That’s Brook’s choice though. He can tell the boxing fans that he was beaten by Spence because of an injury just like he did in his loss to Golovkin, but it won’t be good if he does that. The fans will buy your excuse the first time, but when you try and explain away every loss in putting it on you having some injury, then the fans start to see it like your making excuses. Brook, 30, has never lost before in welterweight competition; although some boxing fans believe that he was beaten by Shawn Porter in his clinch-filled 12 round majority decision win over him in 2014. Brook has won his other fighters at 147. Brook’s only defeat came at the hands of middleweight champion Gennady “GGG” Golovkin on September 10 last year-old in London, England. Something that’s not been discussed much about the Brook-Spence fight is the need for Spence to make sure that he doesn’t let the fight go to the scorecards on May 27. Spence is the visiting fighter, and he’s facing a very popular fighter in Brook in front of what will be a huge crowd of 32,000 at Bramall Lane. There will be a lot of boxing fans cheering for Brook the entire fight. We saw the controversial scoring from last Saturday’s fight between American Gabriel Rosado and Martin Murray in their fight at the Echo Arena in Liverpool, England. Rosado outworked Murray and landed the better punches, and yet ye still lost the fight by a 12 round unanimous decision. That fight showed how tough it is for the visiting fighter to come into foreign territory and leave with a decision win. That’s why it’s imperative that Spence make sure that he takes the judges out of the equation for the fight by making sure that he knocks Brook out. If that means having to chase Brook around the ring all night to do so, then so be it. It might also require that Spence knock Brook out with a point blank shot thrown while he’s holding on in one of his likely many clinches that he initiates on the night. You hope that the referee would do his job to stop Brook from clinching excessively, but you can’t for sure whether the referee will be up to the task of doing his job or not. Bradley hasn’t fought in a year since losing to Manny Pacquiao by a 12 round unanimous loss last year in April. Bradley doesn’t have a fight scheduled and it’s quite possible he could be out of action for a considerable time. That’s not good for an aging fighter like Bradley. If he wants to stay relevant and sharp, then he needs to stay active with his boxing career. Even if Bradley were to sign for a fight right now, he’d be looking at him being out of the ring for a year and a half in total.